Protecting & enhancing Arizona’s water supplies for current and future generations. Arizona is sinking. Well, not all of Arizona, just certain groundwater basins in south-central and southern Arizona. Subsidence is a nation-wide and world-wide problem; subsidence as great as 19 feet has occurred since the 1950s in the areas near Luke Air Force Base and the Town of Eloy. Land subsidence is the result of decades of excessive groundwater withdrawal that exceeds natural recharge, resulting in declining groundwater levels. As the groundwater declines, the pore spaces within the aquifer that were once supported by water pressure start to collapse, resulting in subsidence of the ground surface. In Arizona, land subsidence has produced 167 miles of mapped earth fissures, according to data provided by the Arizona Geological Survey (AZGS). Fissures frequently damage infrastructure: roads, canals, pipelines, railways, buildings, and highways. Land subsidence also has changed the natural drainage slopes, causing areas to flood that hadn’t flooded in the past. It has reversed flood control canals, changed aquifer properties, and led to the permanent loss of groundwater storage due to compaction. ADWR has detected more than 3,400 square miles of land subsidence (see: subsidence areas in salmon, above). 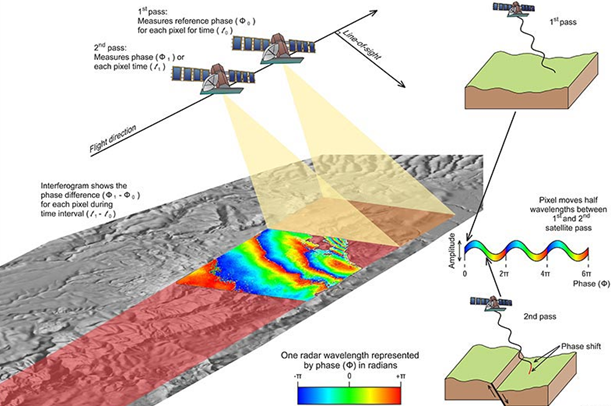 Interferometric Synthetic Aperture Radar (InSAR) techniques, using satellite-based SAR platform data, are used to produce land-surface deformation (subsidence and uplift) products with centimeter-scale vertical resolution. Changes in land elevation are detected through the change in phase of the radar signal. InSAR is used to detect surface displacement over otherwise undisturbed open land and deformation along active faults, on volcanoes, landslides, sinkholes, and other geologic features and hazards. InSAR Drives Groundwater Management. InSAR data have yielded some very interesting results in groundwater basins around the State. Land subsidence rates within the Phoenix and Tucson Active Management Areas (AMAs) have decreased between 25% and 90% compared to the 1990s. This is a result of decreased groundwater pumping, increased groundwater recharge, and recovering groundwater levels in the two AMAs. Land subsidence in groundwater basins outside established AMAs that lack access to renewable surface water supplies have seen subsidence rates increase anywhere from two to five times when compared to the 1990s InSAR data. This includes the Ranegras Plain and Willcox groundwater basins, Douglas Irrigation Non-Expansion Area, and the San Simon Valley groundwater sub-basin. Land subsidence as high as 16 cm/year (6.3 inches) is being measured in the Willcox groundwater basin. ADWR’s partners in subsidence monitoring include: Flood Control District of Maricopa County; Pinal County Flood Control District; Metropolitan Domestic Water Improvement District; Central Arizona Project; Arizona Department of Transportation; Arizona State Land Department; Arizona Geological Survey; Community Water Company of Green Valley; City of Scottsdale; Cochise County; Salt River Project; Petrified Forest National Park; City of Mesa; the City of Phoenix; and the City of Glendale. ADWR currently collects InSAR data over more than 50,000 square miles across Arizona and InSAR data are collected throughout the year to monitor seasonal deformation. ADWR’s extensive library of over 1,500 SAR scenes - used to process InSAR data - covers an area greater than 150,000 square miles at a cost of more than $1.5 million, predominantly purchased through grants and cooperators. ADWR’s statewide InSAR data set for active land subsidence areas spans time periods from 1992 to 2000, 2004 to 2010, 2006 to 2011, and 2010 to the present depending on the satellite used. ADWR now identifies more than 26 individual land subsidence features in Arizona, collectively covering more than 3,400 square miles. Sign up to get breaking news and information about Arizona’s water industry!